Too Poohtastic to Pass Up! He has the most recognizable face. He’s a style icon in his own right. And he greeted the President of the United States in his robe and slippers. Yes! It’s little Prince George! 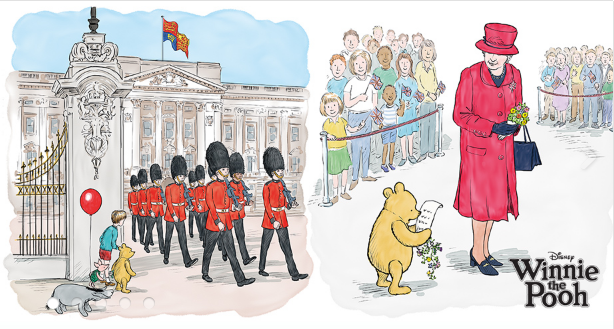 And now, the poshest little Prince is getting immortalized again with a cameo in the latest Winnie-the-Pooh book. Available for free here http://winniethepooh.disney.com/. The Que en and Winnie-the-Pooh have been close friends since birth. Not only were they both born in 1926 – making them ninety years old—author A.A. Milne dedicated a book of songs featuring Pooh, “Teddy Bear and Other Songs,” to the newborn Princess Elizabeth. Rumor has it the Queen is just nutty for the good-hearted bear. The Queen lived in her palace, as Queens often do. Doing all those busy things that busy Queens do. That doing nothing much can be the BEST thing to do. We’re sending you some quiet and a little time to play. Written by Jane Riordan, Mark Burgess illustrated, and Oscar-winning actor Jim Broadbent (Professor Horace Slughorn of Harry Potter and Bridget Jones’ Dad) narrates the audio story. It’s all perfectly charming—right down to Piglet handing his iconic red balloon to the little Prince.